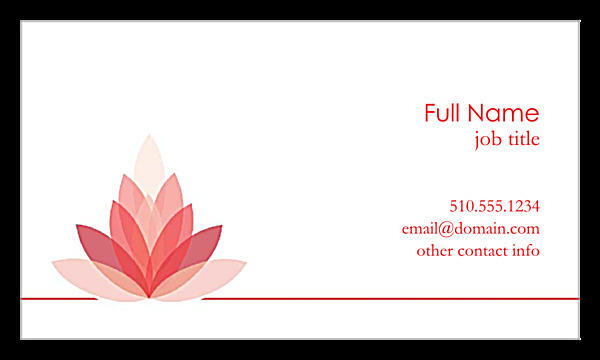 If you’re a yoga master or operate a health club or spa, you can’t go wrong with our Lotus Connection business card design template. Print custom business cards with a feel-good theme of mind, body, and soul! On the front, you’ll find a replaceable image of a yoga instructor in-pose, flanked to the left by a multi-layered lotus illustration. Further left, your company name and website URL are highlighted in a large font, and your address is listed below. On the back, the full lotus illustration is accented by an edge-to-edge underscore, with your name, title, and contact information right-justified for maximum impact. Lotus Connection is available in three different color schemes: red, blue, and green. Personalize your business card design with our online business card maker today! 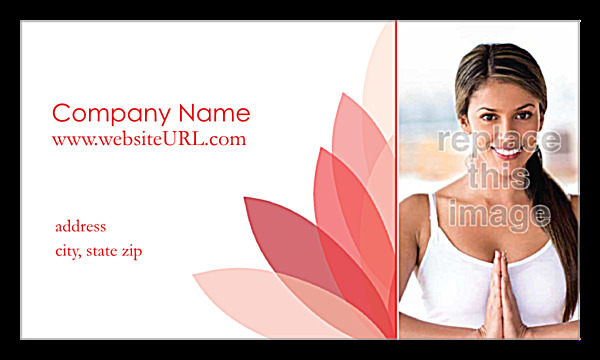 Lotus Connection was create by a professional designer, but you can customize it to match your name, company, and brand fast and easy with our online business card design tool. Simply choose your template and color scheme, then point-and-click your way to personalizing your name, contact information, and image. It’s fast, easy, and free! Premium paper stock and high-quality printing bring your custom business card design to life. Without them, even the best designs look lackluster; but with our affordable, high-quality printing you can expect your professionally-designed, custom business cards to enhance your brand image wherever you go – guaranteed! Our custom printing team is on-hand to help you print the perfect business cards. Need even more customization? We offer foil stamping and die-cut shapes. Want a complete corporate identity kit? Look no further than our letterhead, envelopes, pocket folders, sales sheets, and more!